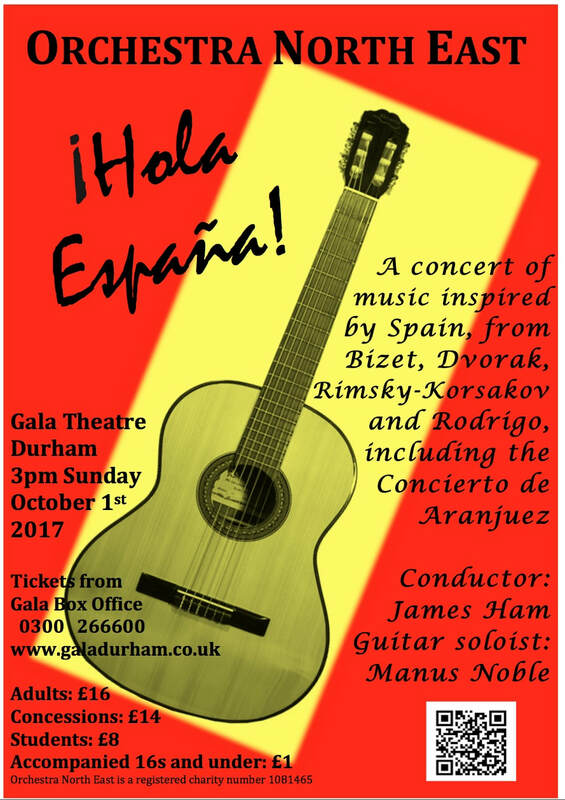 Orchestra North East’s autumn 2017 concert at the gala Theatre, Durham in October 2017 had a distinctly Spanish flavour- we decided to give it the name – ¡Hola España! ​it was truly an afternoon of evocative and exciting music. Dvorak: Carnival Overture, opus 92. Bizet: Suite no.1 from Carmen. Rimsky-Korskov: Capriccio Espagnol, opus 34. Soloist in the Rodrigo Concierto de Aranjuez, was the exciting young classical guitarist, Manus Noble. One critic wrote recently, “Manus Noble is one of the very best of the new generation of guitarists. His fantastic technique, fluid, intuitive musicianship and warm and engaging on-stage personality make Manus a complete artist.” The intimate atmosphere of the Gala Theatre was most suited to his performance. Our conductor for the afternoon was James Ham, a young conductor of increasing repute across Europe and beyond. In January this year James stepped in at short notice to cover one rehearsal for our last concert, and we were very pleased to be able to welcome him back for a whole week of music this time! 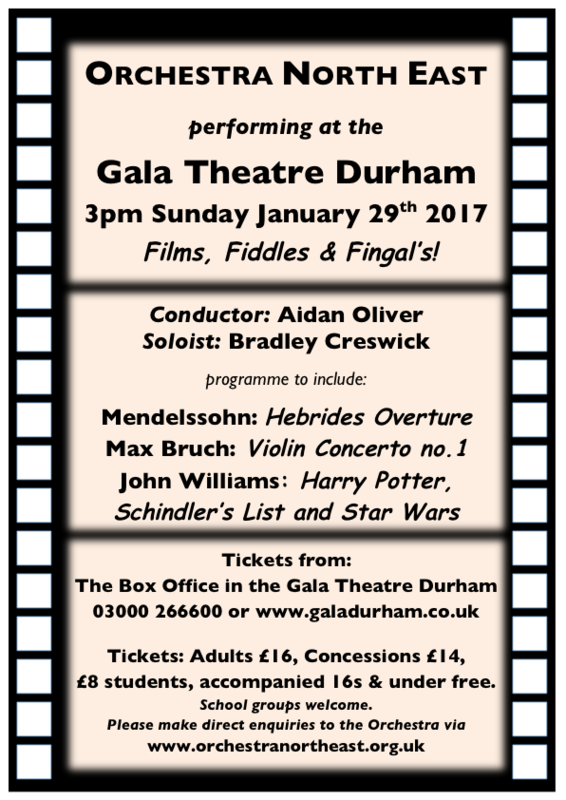 Thanks to all who came to our concert in January in the Gala Theatre, Durham. In its 30-year history, Orchestra North East has given 97 concerts, performing over 200 pieces by 76 composers. Browse through our archive of past concerts and you'll get an idea of the range and scale of the works we've done over the years. Alexander Baillie will be performing Elgar Cello Concerto. Read the review 'Orchestra North East Rises to the Occasion' from The Chronicle. Read about our tour of Europe at our concert last February 2016 in the Gala Theatre, Durham! Orchestra North East leads its audience on a glittering European tour!